Natalie & me waiting for the show to start. Last month’s success went to my head [Report Rocking S], causing me to forget that Winter Tournament is not Academy. I was swimming with bigger fish. Given that, two fifth places weren’t so bad. At least one of the names ahead of me rides in suit equitation the rest of the year. Seven riders in the class was not overwhelming. Not at all. Instead, it gave me a chance to practice getting out of the crowd & showing my horse. I did, more so as the day went on. I also tried to keep equitating while riding. I have a habit of doing one or the other. Excuse me, gotta fix something over here. Okay, I’m done. Back to looking pretty. In the pattern class, I nailed 90% of the moves. Bad news: I blew one of the leads in the canter serpentine. Good news: so did everyone else. Which proves that one keeps fighting for every point, even when all seems lost. Checking out the cows next door. I attempted a little of the look-ahead-and-plan that I had been doing in the riding classes. Note to self. You are NOT ready to do two things at once in a cart. Natalie trundled on regardless. She can be an occasional heifer under saddle [Report SSF], but is – at least has been so far – a marvelously steady soul in front of a cart. We even managed to stir in a little sizzle. Not enough to take on Alvin and his driver, but a good effort for us. Show tomorrow. Digging up warm clothes. Predicted high of 42o. Predicted 26o at etd. Why? I have no good answer other than Horse! Show! Not so bad. Good clothes. Bright sun. Last night, I dreamt that I forgot to tweet all day. Dunno what that says about my tweeting habits. Or about my dreams. 5/7, 1/4, 5/6. Won pattern class despite bobble. (Bobbled least.) Improved my ringmanship in non-eq altho ribbon didn't change. Happy. The 3rd class started with 7 but ended with 6. Hence the different number above. Driving 2/2. Fewer nerves, more sparkle. Also happy. Pulled a princess. Left show before it was done. Gasp. Am beat. When do I EVER want to leave a horse show? Once the excitement wore off, I suspect I was tired from being cold all week. The difference between a cold snap in the Southeast and one in New England: in New England the houses are built for it. My heating system has been panting & puffing to keep the house in the mid-60s. Enervating. 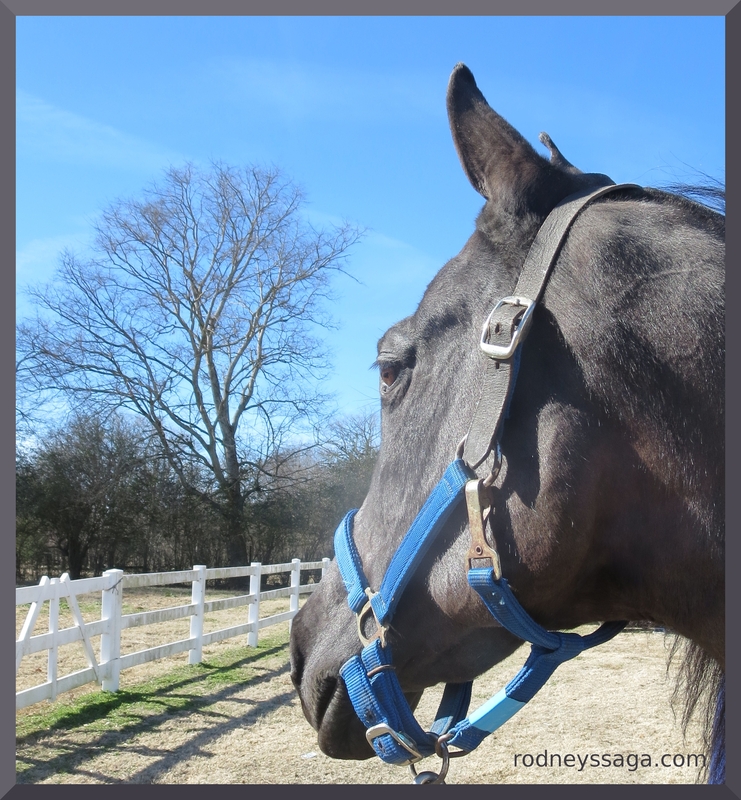 Loved the point about everyone messing up their canter leads. 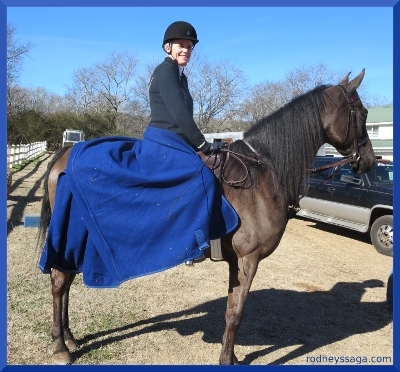 Katherine has done side-saddle, and i have the pix to prove it! They’ll turn up one of these day. She looked really elegant. 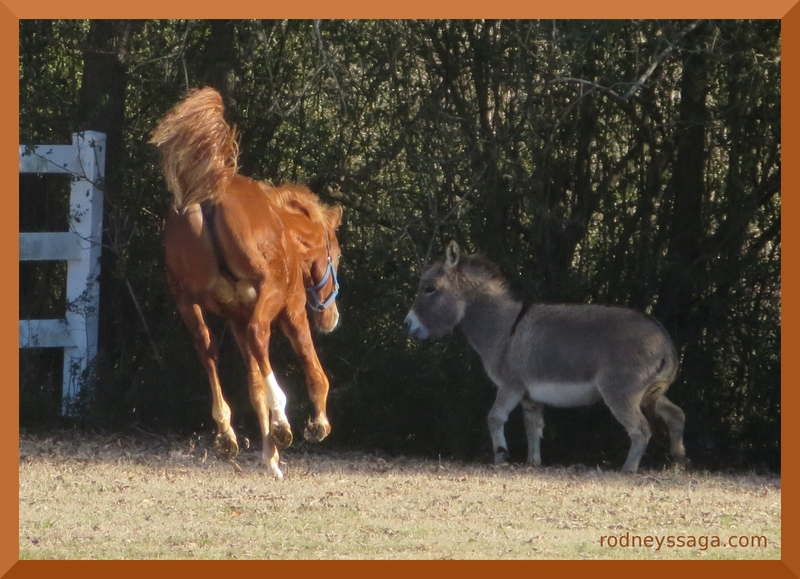 Who is that freaking out at the adorable little donkey? Random youngster who lives at the farm. Cold morning. Frisky foal. I’ll ask; what drama happened that a class started with 7 and ended with 6? Dish! Please? One of the riders was riding something that was completely convinced the end of the world was coming. Apparently very experienced rider and extreeeeeeeeeemely green horse. Anyway, rider very intelligently pulled out before either she or anyone else got hurt. Kudos to the kid.